Kyogonza is handcuffed after he beat up the judge. Courtesy photo. The Masindi Chief Magistrate, Catherine Angwero, is nursing serious injuries after a suspect she had sentenced to six years in jail emerged from the dock and severely punched her. 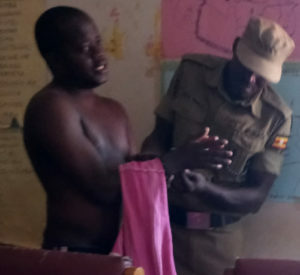 Fred Kyogonza, a former clinical officer with Masindi District Local Government, after being handed the sentence for being a civil debtor, emerged from the dock onto the judge’s bench and started throwing jabs on the head and in the face of the judge. By the time Prison warders intervened, the judge’s mouth had been disfigured and she was bleeding profusely. Angwero was rushed to Kitara Medical Centre, Masindi with several injuries to her head. “Plans to have her transferred to Kampala for better medical attention. She is currently complaining of serious headache,” a source in the judiciary intimated to PML Daily. Uganda Judicial Officers Association (UJOA) president Geoffrey Kaweesa condemned the act and urged government to beef up security for all judicial officers. “This justifies UJOA’s call to securing all judicial officers especially magistrates and registrars,” he said.